The management of Federal University Lafia has announced the commencement of UTME/DE Post-UTME admission registration and screening for 2018/2019 academic session. 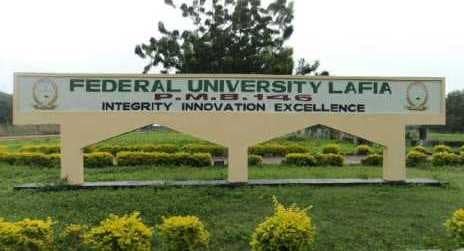 * Choose Federal University Lafia as their FIRST CHOICE in the 2018 UTME and scored a minimum of 170 cut-off mark and above. * Direct Entry Candidates will need to input both their O’ Levels and higher qualifications accordingly. Diploma, NCE, IJMB and A’Level GCE results (Direct Entry candidates). Eligible candidates for screening should pay the sum of Two thousand Naira, (N2,000.00 only), this payment excludes bank administrative charges. After making payment, candidates are to return back here putme.fulafia.org to finish their registration. Note: that JAMB will only clear shortlisted candidates who have complete O’level results. Candidates are advised to visit any JAMB office or CBT accredited Centres to upload their O’level results on the JAMB website. The FULAFIA Post UTME Form closing date is Monday, 20th August, 2018. Before the Post utme screening. We will let you know when the form is out as well as the date. Pls wat is d cut off mark for post utme? I heard the screening is on the 23th of july………true??? The admission list is not out yet. The screening commence from 19 to 21 September. how do i apply because i cant find the portal for the post utme registration? i would be grateful if i get a reasonable result today. The form will be out before August. We will inform you when this year’s form is on sale. It is an actual examination. It will be out anytime soon. Perhaps, they forgot to renew their subscription.